So for this month's newsletter, it's December, and we're obviously headed into that holiday season. So we're gonna talk about a couple of strategies that we can kind of enjoy the holidays a little bit better and survive the holidays without having any aches or pains. Every year, when we come back from a kind of Christmas break or New Year's, we unfortunately run into a couple of patients that said, "Hey, over Christmas and New Year's, like things went bad. My back started bothering me or my neck or my shoulder hurt." So we're gonna talk about one, why that happens, and a couple of things we can do to avoid that from happening and kind of maximize our enjoyment of the holidays. So number one is you're gonna be going, probably, to a lot of parties -- work functions, family functions, stuff with friends -- and it's natural that we're gonna start to enjoy richer foods, more desserts, a little more alcohol. A lot of that is gonna raise the inflammatory load on our body, meaning it's gonna make more inflammation. So things that might have been kind of in the background that you weren't really feeling, you're gonna start to feel them over the holidays, just because you're body's gonna create more inflammation. So I'm not saying to live in a bubble and don't go to any of the parties and don't enjoy yourself, but there's a lot of things that we can do to we can still enjoy the holidays, have fun with our family and our friends, and not feel like it just throws our body into an absolute garbage can. So here's a great tip from our registered dietitian. So if you end up at a work function or a family gathering where you've got a big spread of food out. There's lots of decadent desserts, lots of rich foods, and you're gonna be going up and down, getting multiple plates of food, try to make that first plate really vegetable-heavy. Like go grab a little bit of a salad, grab a couple of, whatever, carrot sticks, some broccoli, some cauliflower, whatever, and load up on some vegetables on the first plate. It's gonna kind of get you a little...it's gonna make you full a little faster, and then you can enjoy them. Have some desserts after, have some of the richer food faster, but you're gonna have a feeling of being a little more full, so you'll probably just pick at some of the more rich stuff, rather than going straight to the kind of unhealthy, less desirable snacks, and gorging on them, and ending up in kind of a sugar-linked [SP] coma which is gonna then end up increasing a lot of the knee pain, back pain, headache stuff that we're gonna have later. So great advice on going early on the good nutrition stuff, and then you don't have to deprive yourself. Have some of the sweets, have some of the snacks, but it's gonna be a lot easier to kind of maintain your portion control once you've eaten some healthy food on the front end. Getting to and from those events, you're probably gonna find yourself either flying to visit your family, or you're gonna be in the car for long periods of time. This is stuff we'd talked about quite a bit. But when we're in the car for hours and hours, passive sitting, my weight's all sitting in my pelvis, sitting in my lower back, most cars are pretty soft, we end up kind of in just not ideal positions, so we wanna do a couple of things. We wanna try to actively sit in the car, think about my spine being as long as it can, feeling like my abdomen braces, and feeling like I rotate my knees out to really rotate my glutes turned on to help stabilize my pelvis. If you're not the driver, if you're in the passenger seat, you can even put your arms on kind of the arm rests and try to elevate your hips off of the seat periodically, to get full hip extension, almost make my body feel like I'm standing in the car without having to actually get vertical. If we're on the airplane, we're obviously actually gonna get the golden aisle seat so you can stand, about once every half-hour or so, just so we can break up that. 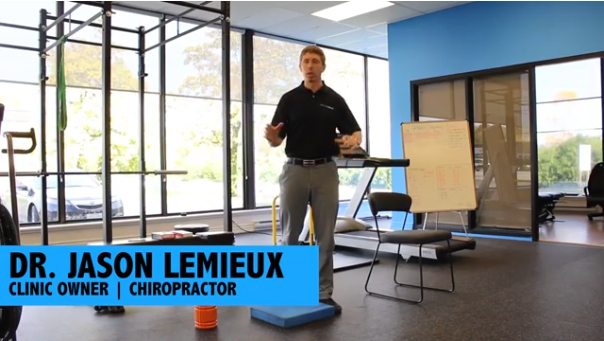 When we get to where we're going, we're gonna wanna stretch out those hip flexors. You've been sitting for long periods of time, we're gonna come down on one knee, we're gonna tilt our pelvis, squeeze our glute, get that really good hip flexor stretch. Again, if you're driving long distances, this is a stretch you can do standing, even as you're gassing up the car, kind of in between the middle of the trip. When we get to where we're going, here's a great, hey, Christmas gift idea. Lots of our patients have foam rollers, it's great to have a small, hollow roller to travel with. This will easily fit in most bags or in your luggage. You can put socks, t-shirts, a bottle of wine, bottle of rye, whatever you want, in the foam roller and rest in your luggage. And then when you get wherever you're going, probably the most important piece to look at is let's roll out that upper back. Let's create a little bit of upper back extension, take out some of that postural stress that we've accumulated from sitting on the plane or sitting in the car for long periods of time. That's gonna help your body feel a lot better when you get to your destination. You're not gonna feel as stiff, and you're not gonna feel like you've aged 20 years by travelling to your gathering. And then yeah, it's the holidays, people give gifts, so why not give the gift of health? Give somebody something that they might not spend their own money on, a travel roller, if you already have a regular foam roller, might be something you don't wanna spend extra money on, but it makes for a great gift and people really appreciate it. Other things that you can get for people that they may not spend their own money on but they'll use, a heart rate monitor. Heart rate monitors are something that me and a lot of the staff of the clinic use when we work out. I use a heart rate monitor literally every single day. It gives me great information as to whether or not my body's recovered from exercise. It can help measure your cardiovascular fitness. So if you're gonna set these New Year's resolution goals, rather than having these goals that we can't measure, let's maybe give somebody the gift of something that can actually help them be more accountable to their health. And another great idea that people don't pay attention to that I've come full circle on is compression socks. They may be an expense that someone's not gonna spend for themselves, but wearing compression socks when you travel, wearing compression socks after a workout to help recover, or even while you're working out to help improve blood flow, they're invaluable in terms of bang for the buck in terms of what's gonna make me feel better. So if we can be a little smarter with the food that we have at our gatherings, if we can travel a little more efficiently, if we can recover from that travel a little more efficiently, and then give the gift of health, you'll come out on the other side of the holidays far better.